UCLA researchers develop inexpensive, high-mobility semiconductors for LCD and OLED screens; a team led by Oxford University researchers shows that the lead in solar cells based on lead halide perovskites can be replaced with tin. UCLA researchers have created a device based on a new material and manufacturing process that they say could lead to a significant leap in the quality of images on smartphones, computer displays, TVs and inkjet printers. The new material and manufacturing process are used to produce semiconductors that are essential to LCDs and organic light-emitting diode (OLED) displays, which can be produced without requiring a clean room or the expensive equipment now commonly in use. 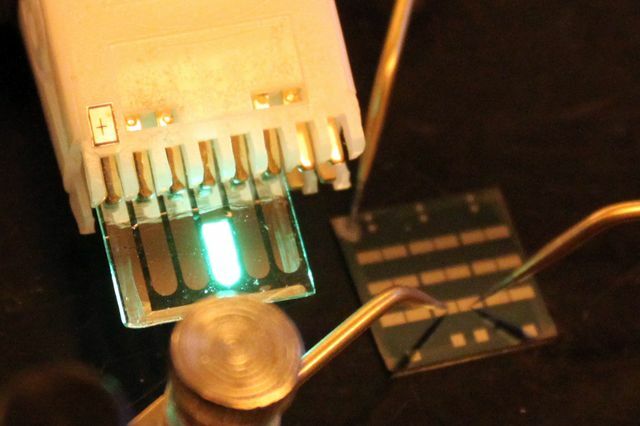 The researchers said this semiconductor process is faster, less expensive and more reliable than existing processes and they believe it can be used as a technology to replace existing processes and scale up production of thin-film transistors. Currently, amorphous silicon-based TFTs are the most popular technology in LCDs, but they suffer low mobility. The UCLA-developed product, a non-silicon–based amorphous oxide semiconductor TFT, offers mobility that is 10 to 20 times greater than that of an amorphous silicon-based TFT. The device, which is composed of indium gallium zinc oxide and indium tin zinc oxide, has channels that are designed differently than those in other TFTs. Also, the processing technology is different. According to a team led by researchers at Oxford University, lead is not an essential component of a new kind of low-cost, high-efficiency solar cell. The team has demonstrated that the lead in solar cells based on lead halide perovskites can be replaced with tin. Perovskite solar cells, pioneered by the Oxford team, promise to be cheap and easy to mass produce and have already achieved a 17% efficiency at turning sunlight into electricity after just two years of research – potentially transforming prospects for cheap large-area solar energy generation. New research considered what could replace the lead currently used in perovskite solar cells to help them generate energy. While the amount of lead in each cell is tiny, the presence of the metal could still be an issue when it comes to commercialization, with firms looking at the entire lifecycle of perovskite solar cells products and their disposal. As such, the researchers report that they have created the first lead-free perovskite solar cell – with non-toxic tin replacing lead in the cell’s absorbing layer. By using tin, they found that they could keep everything that is good about lead in a solar cell but use a metal that is safe, cheap, and abundant. The prototype cell achieved a 6% efficiency at turning sunlight into electricity but the team believes that in theory such cells could achieve much higher efficiencies, over 20%, as long as the material can be made more stable. If a stable version can be created, which the team are currently developing, it could provide an alternative that is as efficient as conventional silicon-based solar cells whilst being non-toxic, not requiring intensive energy input and be much cheaper and easier to mass produce. The demonstration of solar cells using tin-based perovskites is a clear indication that good solar cell operation is not unique to lead, and therefore also opens up the use of other similar metals in the perovskite structure, leading to a multitude of new research avenues for optimizing these materials.